After his marriage with Manuela Sánchez in the Saint Cayetano’s Church, he left for Zamora, where he lived for a short time, until he decided to come back to Madrid. In 1837 Luis Candelas was arrested and sentenced to death. His card went as follows: “Luis Candelas Cagigal, 28 years old, married, born in Madrid, currently living in 1 Cuchilleros street, professional thief, medium-sized height, black hair without hairnet, large mouth and prominent jaw, well formed and sturdy”. Some years later, in 1949, Félix Colomo Díaz, a famous bullfighter from Madrid, born in Navalcarnero, falls in love with the old caves under the Arco de Cuchilleros and turns them into a restaurant, so that the history of Old Madrid remains over time, thus fulfilling the last wish of Candelas. Félix Colomo, a brave man ever there, combined the dream of being a bullfighter with this one of founding this restaurant, by devoting heart and soul into his beloved “Cuevas”. They are two men with a certain parallelism: Candelas was a romantic hero and Colomo was a courageous man in the bullring, in Las Cuevas de Luis Candelas and in life. With more than a half century of history, Las Cuevas de Luis Candelas continues to open its doors every day, keeping the style, the local colour and the singularity of that time, and keeping the secret of the best traditional cuisine to delight everyone who visits this restaurant. “Las Cuevas de Luis Candelas: The dream of a bullfighter”. 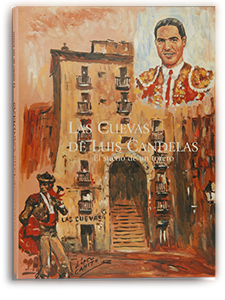 This book pays tribute to the historical figure of Luis Candelas, the most famous bandit in Madrid, and to Mr. Félix Colomo Díaz, famed bullfighter and founder of this restaurant. In its pages you will discover the secrets and mysteries of the Candela’s time, and the stories and anecdotes from all those people and celebrities from the worlds of culture, art, politics, sports, etc., who have been to the restaurant during these years.